Sunday 18th May 2008 I was here, teamed with her, doing this. We where among other people, all cooking astonishing meals! Everything was organized by her in partnership them, with some outstanding sponsors! I spoke about it here and here (Italian version) and there we published our entry even here (recipes included!! !And thanks to Julia for the wonderful job she did!)! We had fun! Loads of fun!!! Now, after the tasting competition (which we won!!!!! Yeah! ), there is the on-line competition. And as you have just one food blogger in your mind, and you love her so much, GO and vote for us! We Need you!!! What an incredible summer feast! I actually like all the links. It makes for some suspense. 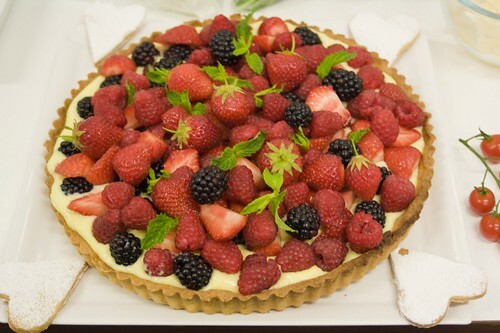 The tart is absolutely gorgeous! that tart looks fantastic! i saw that tart in the recent sainsbury magazine looks amazing and summery! Yes, that tart was truly amazing.